Congrats! You have made it through the toughest part of pregnancy. This often feels like the honeymoon period of pregnancy – you might be starting to feel like yourself again, your energy might be returning, you have ‘the pregnancy glow‘, you are starting to show. This may be the time to also help support healthy skin especially around the belly and breasts. The oils that can be useful for that are Frankincense, Lavender, Myrrh, Gentle Babies and Tender Tush Ointment. Apply 2-4 drops of Frankincense and Lavender mixed with Coconut oil generously over the belly, breasts and thighs. From stress to stretch, these EO’s can be of great help. 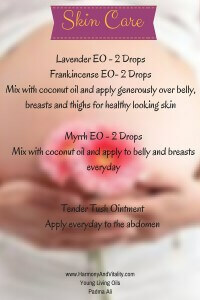 Another option is 2 drops of Myrrh EO applied everyday on the growing belly and / or breasts. Tender Tush Ointment is another great option. Apply everyday to the abdomen for healthy looking skin. As you and your body continue to adjust to supporting growing a human, you may notice changes not only in your body but also in how you feel. Don’t forget about the oils that can support your emotional life during this time. All the oils indicated for the First Trimester can be used during this time as well.